Of all the uses for robots, harvesting plants seems like one of the most practical and therefore promising ways to put these machines to work. I’m not alone in thinking this. Based on findings from 1,300 farmers recently surveyed by market research firm Alpha Brown, the robot-harvesting market is now worth $5.5 billion. And that’s just the early adopter segment. Because the robotics-for-harvesting segment is so new, and because most of the machines aren’t yet available for commercial use, Alpha Brown confined its findings to this segment. But there’s much to discuss within that early adopter market. And while harvesting bots aren’t the only ones rolling around the farm these days, they serve an especially sensitive area of the agricultural supply chain. Harvesting things like fruits and vegetables requires labor, and labor on farms is in short supply these days. In Santa Barbara County alone last year, $13 million of strawberries, broccoli, and produce was left to rot in the field because there weren’t enough workers harvest the crops. Another estimate states that 20 percent of produce grown in the U.S. never leaves the farm because of either labor shortage or cost of labor. That shortage is, of course, wrapped up in a web of economics and politics I’ll leave you to read up on yourselves. The bottom line is that labor is an issue when it comes to harvesting produce, and robots are seen as one promising solution to the problem. And while only about 3 percent of growers currently use robots for harvesting, there are plenty of choices out there for those considering. The following are just a few companies making promising moves in this space as they bring their bots to market. Harvest Automation has been around since 2008, originally operating under the mission of using robotics to solve problems across various industries. The nursery and greenhouse market is one such area that needs the help, as the struggle to find enough labor is especially pervasive here. Enter the HV-100, the company’s flagship product. Aside from looking a little like Wall-E, the robot automates the task of spacing of containerized plants commonly found in nursery operations. As plants grow, their containers need to be spaced increasingly farther apart to ensure a uniform canopy overhead. The HV-100, which is built to handle most container sizes, makes this manually-intensive task faster and more efficient, and the spacing more accurate. The HV-100 is also designed to work alongside human laborers, rather than replace them, and can be used both outdoors and in. Fruit is far and above the most delicate type of produce out there, which makes the idea of using harvester robots especially practical. Spain-based company Agrobot has narrowed this idea down to one of the most sensitive fruits out there, the strawberry. The company’s SW6010 uses morphological and color analysis to determine, in real time, how ripe a fruit is, its size, and other factors that will determine whether it gets collected. The robot does this one strawberry at a time, which sounds like it would take forever but happens in seconds, according to Agrobot’s site. 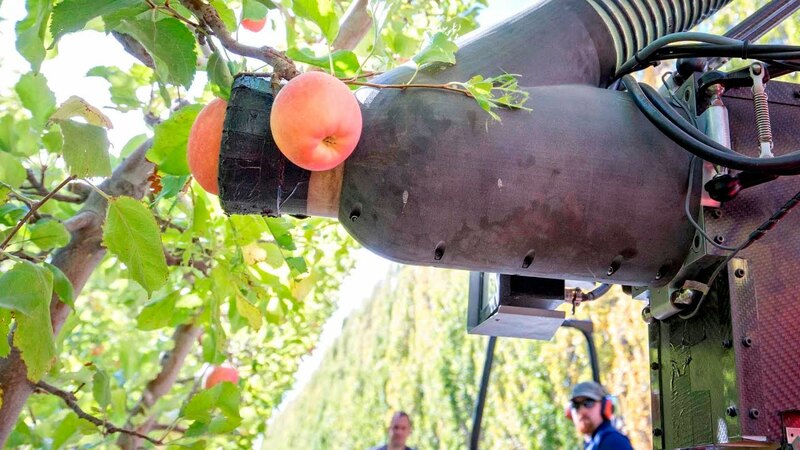 Hayward, Calif.-based startup Abundant Robotics spun out of SRI International and is currently testing a prototype that automates apple picking. Using computer vision algorithms, the robot locates the apples and picks them using a vacuum-like mechanism. To robot is designed to pick one fruit per second from the tree. At the same time, Abundant says the machine is gentle enough not to damage the fruit during the harvesting process. The company is reportedly planning to go from prototype to mass production in 2018. FRRobotics takes the concept of harvesting delicate produce one step further with its machine, a grasping hand that can be adjusted based on the fruit it’s picking. Strawberries, for example, would need a much more delicate touch than apples. With FFRobotics’ yet-unnamed machine, a simple modification could accommodate those different needs. This also allows farm to use harvesters over multiple seasons. The robot emulates the way an actual hand picks fruit and can pick, according to the company, “10 times more usable fruit than the average worker.” Like Abundant, FRRobotics’ machine uses advanced image processing to locate and harvest the fruit. Energid makes a few different kinds of robots, among them a citrus harvesting system. The prototype system was tested in a Florida orange grove by mounting it to a four-axis hydraulic arm, which in turn was mounted to a truck. The result? The machine can pick an orange every two to three seconds, with 80 percent picking accuracy. You can check out the machine shown in slow-motion below, to get an idea of just how many oranges two to three seconds yields. Right now the biggest question mark seems to be cost. Farmers surveyed for the Alpha Brown who hadn’t yet integrated robotics into harvesting said the technology was either too costly or their farms weren’t big enough to justify the purchase. It’s a little early to tell if this will change as more robots become commercially available. But given the millions of dollars in un-harvested produce we’re losing, let’s hope these companies find a way to get more machines onto more farms, sooner rather than later.